Pablo Picasso? Louis Zukofsky? William Fifield? Apocryphal? Calculators can only give answers. Based on the context I think Zukofsky was crediting this saying to Pablo Picasso. The section of the poem with these words was published in 1967. Can you determine which of these quotes is accurate? Was Picasso really talking about calculators or computers? Or did he use both quotes? I feel I am nibbling on the edges of this world when I am capable of getting what Picasso means when he says to me—perfectly straight-facedly—later of the enormous new mechanical brains or calculating machines: “But they are useless. They can only give you answers.” How easy and comforting to take these things for jokes—boutades! It is clear the Fifield was talking about devices that today would be called computers. 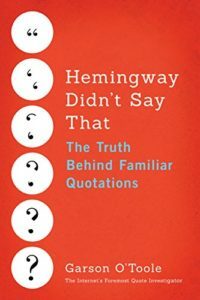 QI believes that it is also possible to see how both versions of the saying highlighted by the questioner could have been derived from the text in the Paris Review. Fifield later revised his comments and introduced a third slightly different version of the saying as discussed further below. Here are additional selected citations in chronological order. ‘art begs disrespect, calculators can only give answers. The poet Zukofsky probably selected “calculator” based on the phrase “mechanical brains or calculating machines” printed in the Paris Review. QI’s work on this post was greatly aided by the online resource “Z-site: A Companion to the Works of Louis Zukofsky” edited by Jeff Twitchell-Waas [ZJTW]. Extensive line-by-line annotations for the work “A” are presented on the site. QI would also like to thank Zukofsky expert Mark Scroggins for his kind help and for his pointer to Z-site. He said contemptuously: “What good are computers? They can only give you answers.” I think it the most significant single thing I ever heard him say. Answer is the dead stop. Probably creation shall prove a manifold instantaneous adjustment to thousandfold things; the “conclusion” but a stop, and all real artworks unfinished. I feel I am nibbling on the edges of this when I am capable of getting what Picasso means when he says to me—with a perfectly straight face—of computers: “But they are useless. They can only give you answers.” How easy and comforting to take these things for jokes! Picasso makes a charming comment on computers: “But they are useless. They can only give you answers.” In fact, Mr. Fifield likes this one so much he quotes it twice. The answer given by the magazine was d.Pablo Picasso. The important reference work The Yale Book of Quotations does contain this saying and cites the version based on page 145 of Fifield’s book [YQPP]. In conclusion, QI believes that this quotation originated during a conversation between William Fifield and Pablo Picasso. However, the phrasing given in the Paris Review in 1964 was not ideal for memorization and transmission. The initial statement used a pronoun for the pivotal referent; hence, it was not self-contained. Even Fifield did not like the phrasing and offered another version of the quote in 1982. A careful statement might be rendered as follows: [As Pablo Picasso said of computers]: But they are useless. They can only give you answers. Yet, the common modern version: “Computers Are Useless. They Can Only Give You Answers” is semantically a reasonable match to the expression recorded by Fifield.